When I ask my Father what he would like as a present he usually replies with a smile, “I have everything I could possibly need.” Whilst it is extremely heart warming to know how fulfilled he is it does make the tricky task of gift buying even more difficult. 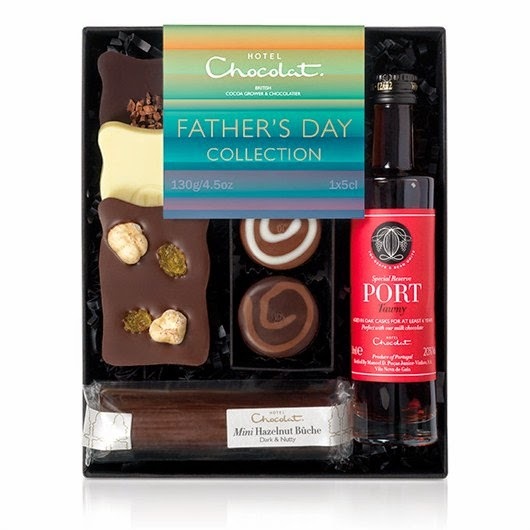 Thankfully help is at hand with Hotel Chocolat and their fabulous range of Father's Day Gifts. From the Beer Selector chocolates to the For My Dad Collection there is something for all Dads and Grandads, budgets and tastes. I've received Hotel Chocolat products before and I can attest to the quality of their products and the extremely smart packaging they arrive in. You can either order online or pop into one of their stores. For one lucky reader of JibberJabberUK I am offering the chance to win one Hotel Chocolat Father's Day Collection. The winner will be contacted via email by JibberJabberUK and the prize will be sent to you from Hotel Chocolat. Promotion runs from Friday 23rd May 2014 and all entries must be received by Midnight (BST) on Thursday 5th June 2014 (evening of 5th June and 6th June 2014) at the latest. The winner's email address and postage address will be passed onto Hotel Chocolat for the purposes of delivering the prize. Prize draws are open to UK residents only. The winner can choose to deliver the hamper anywhere within the UK. No persons under 18 years of age may receive the winning prize as it contains alcohol. This promotion is in no way sponsored, endorsed or administered by, or associated with, Facebook. Any information provided is to Hotel Chocolat and not to Facebook & the information will only be used for notifying the winner. No payment was made for this post. Photograph and logo courtesy of HotelChocolat.com. My dad does loads for me as a single mum - all my diy jobs and takes my boys to football and out fishing - so he is a great dad to me and a great father figure to my children! My dad makes me laugh and I have always been able to talk to him about anything. I'll be honest even though its not the best comment. My Gramps is dead and I hardly know my father, I get one greeting card a year, maybe three text messages and haven't seen him for 5 years. My partner (my boys daddy) is great though. He has saved my life, and been with me for 13 years now. My Dad is physically in his 70s but mentally in his 30s - which makes him great fun. He's always game for anything and even when the body is weak, the mind is still willing! My Dad understands me like no one else! He's like a big kid and has a great sense of fun. Just because he would do anything for me. He works so hard and goes without to make sure everyone else has what they need! He is always willing to do everything for us, Its our time to do everything for him, but he still thinks we are 'the kids' and wants to do all the things for us! My dad is always caring and has always been there for me, my mum and my sister. Through the hard times and the good times. My Dad is the best Dad I could have ever hoped for. He adopted my older brother as his own 23 years ago, he's done his best for my siblings and I, he takes care of us, and he helps us out when we need help. He got married in April this year, and I'm extremely proud and happy that he is my father. My dad is always there when we need him and is a brilliant grandad to the kids too! He's patient and supportive with never a critical word! Entering on behalf of my 4 year old son. His dad is so great as he manages to work very long hours and still ensure every weekend he makes magical memories with his son. Always a shoulder to lean on. What makes Grandad so great is how he has always supported me in everything; through the ups & downs of life and by encouraging me to achive my full potential and live my life as best as i possibly can. His love and support is what makes him so special! My husband is a great dad to my daughter they laugh so much together. My Dad is fantastic but since you've asked about Grandad too...My Grandad is 98 and at the moment in hospital after a fall, but up until last weekend he gets his 2 walking sticks and goes for a walk 3 times a day, and is still planting things in the greenhouse and growing his own fruit and veg! He knows how to get on and live life! My father's corny jokes are quite endearing! He is a bit wacky! My dad is unique and funny, makes me laugh every time I see him! My Dad died a long time ago. My Dad always worked hard and put us first. He is just amazing and acts like a man half his age! My Dad has always put his children first and did so well at building a family despite having a tough start in life himself. Always being there for me and spoiling me rotten. Is always there for me and made me who I am today. P for Patience....his mantra - it works! Always there for me if I need him - he will go "the extra mile"
My dad brought me and my sister up alone after our mother died when we were young. He is a great Grandad to my son. Because he still helps me out even though he's in his 80's now! I'm entering for my son who says his Dad is the best as he is always there for him, no matter what. He helps him with his homework and goes out bike riding with him. Hes always there when I need him! My dad can always make me laugh no matter what mood im in! My step-Dad is taking awesome care of my sick mum. I'm entering this for my son, as my dad passed away when I was just 20 years old. My husband works so hard to let me be a stay at home mum. When he is home he is a proper hands on dad just like my one was. Pamela says - he was sooooooooooo kind. My dad is a great dad and granddad he is always there to to help us or cheer us on and when bad things happen hes always there to help!! He's my step dad but has brought me up as his own. I never felt different or less loved than his biological daughters. He's a special man indeed. I haven't got the words to describe how i feel about my Granfather. He was the male role model when i was growing up as my dad wasn't around. He and my Nan are the most important people, apart from my two kids, in my life. My Nan is a very lucky lady; they've been married 60 years this June. My dad always knows what to say, no matter the situation. He has stood by me throughout my tough last 2 years and been there whenever i have needed him. My dad steered me successfully into adulthood. He deserves a medal! My dad smoked from a teenager during the war when it was acceptable. He always wanted to give up but as the years went on it got harder. Last year he decided enough was enough and went to the Stop Smoking Wales group and gave up after 65 years!! So proud of him!! My dad i the funniest person I know. He always makes me smile! Always happy to help and there when needed. Great friend, makes me laugh and there when I need him! He's always been there for me no matter what. Hazel Murphy.My dad is always there to lend a hand. He's so easy going - such a gret example of not sweating the small stuff. He's so easy going - such a great example of not sweating the small stuff. The fact that if I need something doing around the house he can do it! He makes me laugh until my sides are splitting!!! The only thing better than having him for a Dad is my children having him for a Grandad. Even though he might moan and groan a bit (well a lot sometimes) when the chips are down he is always there to help in whatever way he can. He's crackers just like me! He is very patient with my 3 boys. My dad has done a lot for my over the years as I have been widowed twice (at age 28 and 40). I have no transport so he either takes me or fetches for me the "heavy" shopping like sack cat litter or bird seed, compost etc. He's good at fixing things too so whenever anything goes wrong with the house, I can phone & he'll know what to do. Because hes one in a million! My dad was just so gallant. He was my hero. Alas, never knew either of my granddads. My dad was ok, but far too old fashioned, victorian values... Still, he did take us on hoiiday every year and give us regular pocket money, so he wasn't all bad. He helps me out whenever I need a hand! He pretends he is Victor Meldrew but he's actually soft as anything and he's still the first person I go to for help. Sure us girls always think our daddies are right no matter what? !